Over the past three days, MSF medical teams supporting Haitian Ministry of Public Health facilities and working in their own independent medical facilities in Haiti’s capital, Port-au-Prince, have treated more than 200 people suffering from severe diarrhoea, a clinical symptom consistent with cholera. Even if very few of those cases have been confirmed as vibrio cholera through laboratory analysis, the severe symptoms of the patients treated in these facilities is extremely concerning. MSF staff are treating all cases according to standard cholera treatment protocols, with oral or intravenous rehydration and antibiotics as necessary. At all of MSF’s own four facilities in Port-au-Prince, teams have treated an increasing number of suspected cases since Saturday, November 6. These facilities have more than 300 beds already set aside for treatment in cholera treatment centres (CTCs). MSF is currently constructing an additional 320-bed CTC in the Sarthe neighbourhood, where the organisation already maintains a post-operative care facility. “The increasing numbers of cases of suspected cholera in our facilities throughout Port-au-Prince are certainly alarming,” said Stefano Zannini, MSF head of mission in Haiti. While continued public awareness campaigns on preventative measures, such as hand washing, remain important, immediate treatment is essential when responding to a cholera outbreak. The creation of oral rehydration points in affected communities and CTCs is critical to averting unnecessary deaths. The people living in many of the affected areas of the city have limited safe drinking water and sanitation services, both necessary preventative measures. In the Cite Soleil neighbourhood, for example, MSF provides approximately 280,000 litres of water per day; enough drinking water for an estimated 14,000 people but far below the requirements of the neighbourhood’s total inhabitants. “While cholera and cholera-like symptoms can present very quickly and become life-threatening, unnecessary deaths can easily be averted with swift access to properly equipped and staffed facilities in close proximity to outbreak areas,” said Kate Alberti, an epidemiologist with Epicentre, MSF’s epidemiological research centre. Two Haitian Ministry of Health hospitals in Port-au-Prince are also receiving support from MSF. A 20-bed CTC has also been set up in Leogane, where MSF already runs a hospital. In addition to 3,000 MSF staff currently working in Haiti, 75 international staff and more than 400 national staff are focusing on cholera intervention activities. As of now, MSF teams have treated more than 6,400 patients suffering from acute diarrhea nationwide, including a large proportion suffering from severe dehydration, symptoms typical of cholera. MSF is supporting two Haitian Ministry of Health hospitals in the Artibonite Region, where the cholera outbreak originated. Medical teams are working in the main hospitals in St. Marc and Petite Riviere. Medical supplies, such as intravenous fluids, catheters and oral rehydration solution, as well as chlorine for disinfection, are also being provided. But it is outside more populated areas such as these where assistance is especially needed. To bolster health clinics in some of the more outlying areas in the north and centre of the country, in places such as Gros Morne, MSF is supplying IV solution, oral rehydration salts, IV sets, and hygiene materials. Supplies have also been provided to the hospital in the town of Port de Paix in the country’s far north. 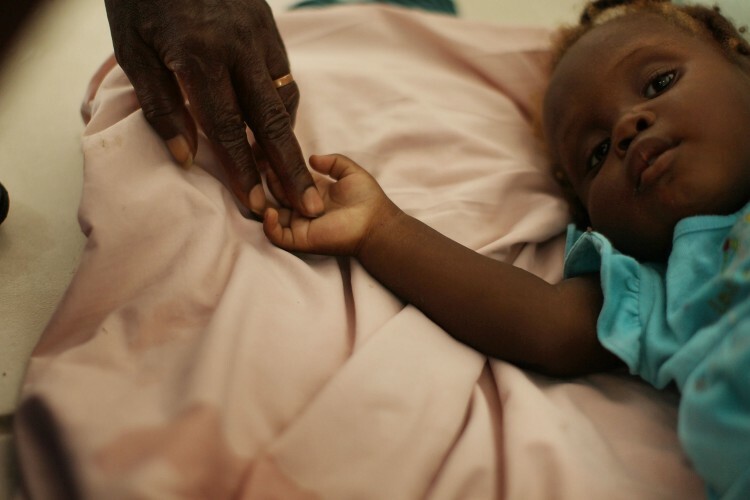 MSF is preparing cholera treatment centres in Gonaives and Bassin Bleu.